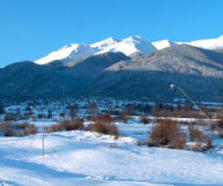 A rapidly expanding town, Bansko is 160km south of Bulgaria's capital, Sofia. Set at an altitude of 935m, it is dominated by Vihren, the highest mountain (2,915m) in the spectacular Pirin range, close to the Macedonian border. The town lacks shopping facilities (there are no supermarkets at all,) but toiletries and confectionery can be bought in the larger hotels. Three museums record Bansko's place in Bulgaria's history and the 500-year old church is a prominent feature. 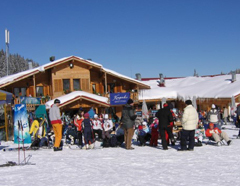 The ski pistes are located in two main ski - centres- CHALIN VALOG (1100-1600m) and SHILIGARNIKA (1700-2500m). They are approximately 10 kilometers above the town on the northern slopes of Pirin, and are easily accessible for approx. 25 minutes on the new Gondola lift which starts from Bansko. The region's pisted area is small, but there is an estimated 750km of skiable terrain if you venture off-piste which can be reached by lift, snowmobile or M18 Russian helicopter. A rapidly expanding resort offering beginners and intermediates great value for money.